What is the CONCATENATE Function? 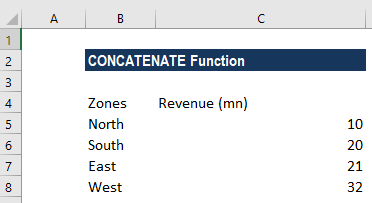 The CONCATENATE Function is categorized under Text FunctionsFunctionsList of the most important Excel functions for financial analysts. This cheat sheet covers 100s of functions that are critical to know as an Excel analyst. The function helps to join two or more strings into one string. As a financial analystFinancial Analyst Job DescriptionSee a real Financial Analyst Job Description including all the skills, experience, and education required to be the successful candidate for the job. Perform financial forecasting, reporting, and operational metrics tracking, analyze financial data, create financial models, we often deal with data when doing financial analysis. The data would not always be structured for analysis and we would often need to combine data from one or more cells into one cell or split data from one cell into different cells. The CONCATENATE function helps us to do that. Text1 (required argument) – It is the first item to join. The item can be a text value, cell reference or a number. Text2 (required argument) – The additional text items that we wish to join. We can join up to 255 items that are up to 8192 characters. Suppose you wish to make your data easy to comprehend for users, then the function helps to do that. Sometimes our data would need to be separated by a line break instead of spaces or character as shown in the previous examples. The most common example is merging mailing addresses imported from a .csv file or PDF file. While doing so, we cannot simply type a line break in the formula like a regular character, and therefore a special CHAR function is needed to supply the corresponding ASCII code to the concatenation formula. Hence, in Windows, we use CHAR(10) where 10 is the ASCII code for line feed. On the Mac system, we use CHAR(13) where 13 is the ASCII code for a carriage return. To get the result as shown above, we need to enable the “Wrap text” option for the results to display properly. To do this, use Ctrl + 1 to open the Format Cells dialog. Switch to the Alignment tab and check the Wrap text box or go to Home tab and under Alignment click on Wrap text. When combining values from multiple cells, we must take some effort as this function does not accept arrays and requires a single cell reference in each argument. So we need to use formula =CONCATENATE(B1, B2, B3, B4) or =B1 & B2 & B3 & B4. Select the cell where we want to output the concatenated range. D1 in our example. Then enter the TRANSPOSE formula in that cell, =TRANSPOSE(A1:A78). Now in the formula bar, press F9 to replace the formula with calculated values. Now type =CONCATENATE in front of the cell references in the Formula bar, put an open parenthesis and closing parenthesis, and then press Enter. The CONCATENATE function will give the result as a text string. The function converts numbers to text when they are joined. The function doesn’t recognize arrays. Hence, we need to provide each cell reference separately. #VALUE! error – Occurs when at least one of the CONCATENATE function’s arguments is invalid. Numbers don’t need to be in quotation marks. #NAME? error – Occurs when there are quotation marks missing from a Text argument. The ampersand (&) calculation operator lets us join text items without using a function. For example, =A1 & B1 will return the same value as =CONCATENATE(A1,B1). In many cases, using the ampersand operator is quicker and simpler than using CONCATENATE to create strings.